Google Cloud Platform does not allow sending emails via standard SMTP ports (25, 465, and 587) but you can use multiple email services for sending, for example, using Gmail Business as typical email service and another one just for sending, know as transaction email service. There are two possibilities, to use our built-in email service powered by Mailgun or another third-party email service. Use whatever is better for your use case, we do not recommend anything is the email industry except G Suite as your daily email service. Not all domain extensions are supported, only generic top-level domain TLDs and country level TLDs. If your domain extension is not supported, you must use alternative email service. To create a sending domain, go to Emails page and click on Add Domain button. Once the domain is created, our system will warn you about the required DNS changes. Take a note, that our system is so smart to the point that will merge the required SPF record if you already have one or will warn you about duplicate SPF values, simply said, just follow the instructions. 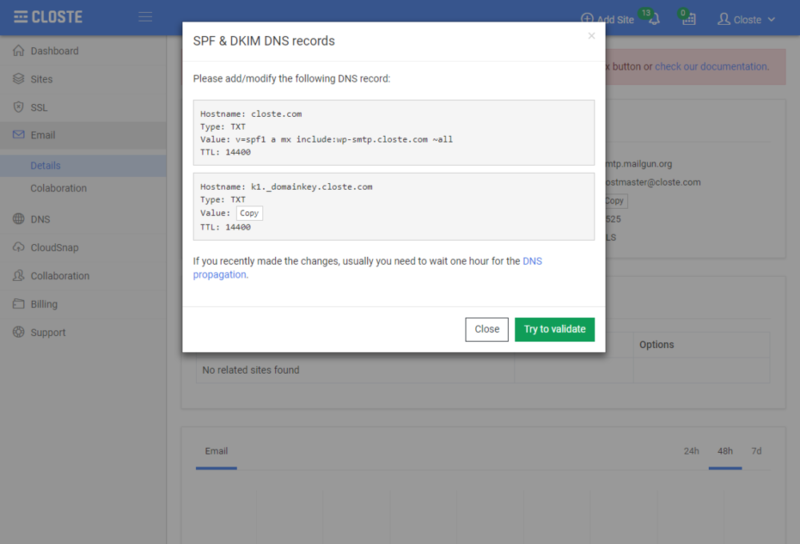 If you are using our DNS powered by Google Cloud DNS you will need to make the changes in our system (the SPF and DKIM record examples), otherwise, the changes need to be made at your third-party DNS provider. Take a note that domain validation is not in real time and you may need to wait for a few hours for the DNS propagation, usually 2 hours after the DNS changes. Sending domain can be used to send emails from all names e.g contact@domain.com or me@domain.com. Once the domain is validated, all you need to do is to install the SMTP service to a related site. 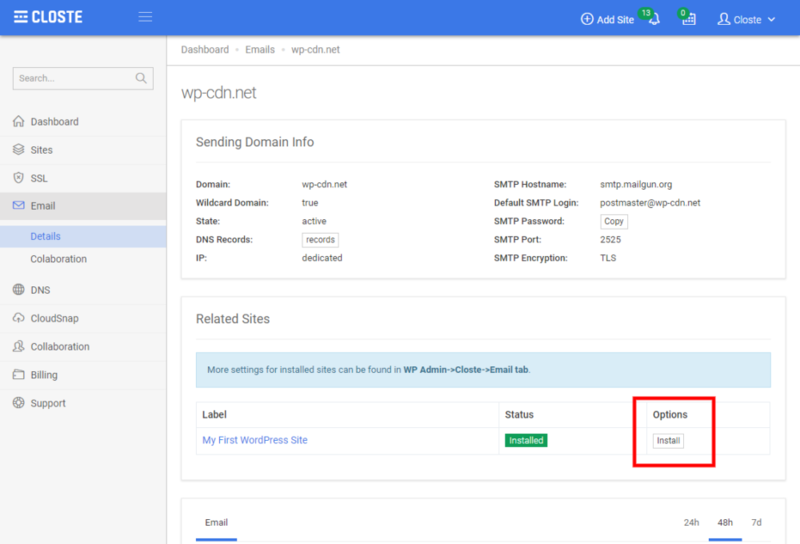 More settings about SMTP configuration can be found in WP Admin->Closte->Email tab.